Google Firebase has a new data storage possibility called ‘Firestore’ (currently in beta stage) which builds on the success of the Firebase Realtime Database but adds some nifty features. 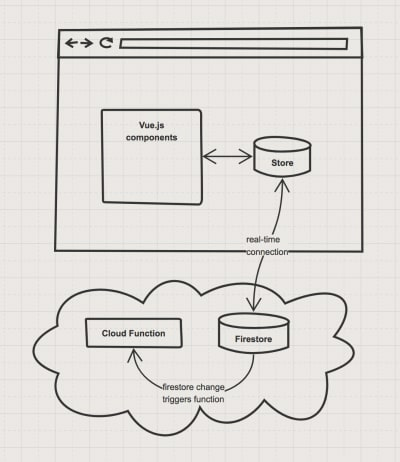 In this article, we’ll set up the basics of a web app using Vue.js and Firestore. Let’s say you have this great idea for a new product (e.g. the next Twitter, Facebook, or Instagram, because we can never have too much social, right?). To start off, you want to make a prototype or Minimum Viable Product (MVP) of this product. The goal is to build the core of the app as fast as possible so you can show it to users and get feedback and analyze usage. 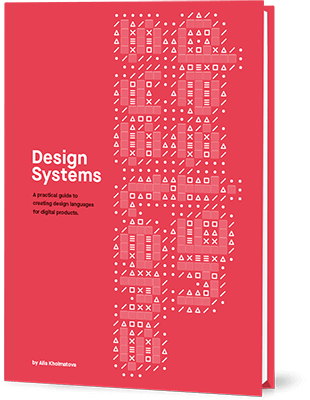 The emphasis is heavily on development speed and quick iterating. But before we start building, our amazing product needs a name. Let’s call it “Amazeballs.” It’s going to be legen — wait for it — dary! 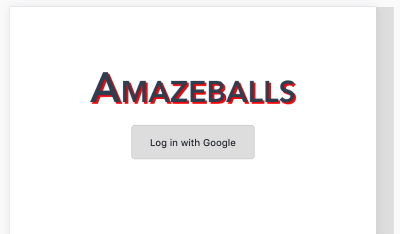 Our Amazeballs app is — of course — all about sharing cheesy tidbits of your personal life with friends, in so-called Balls. 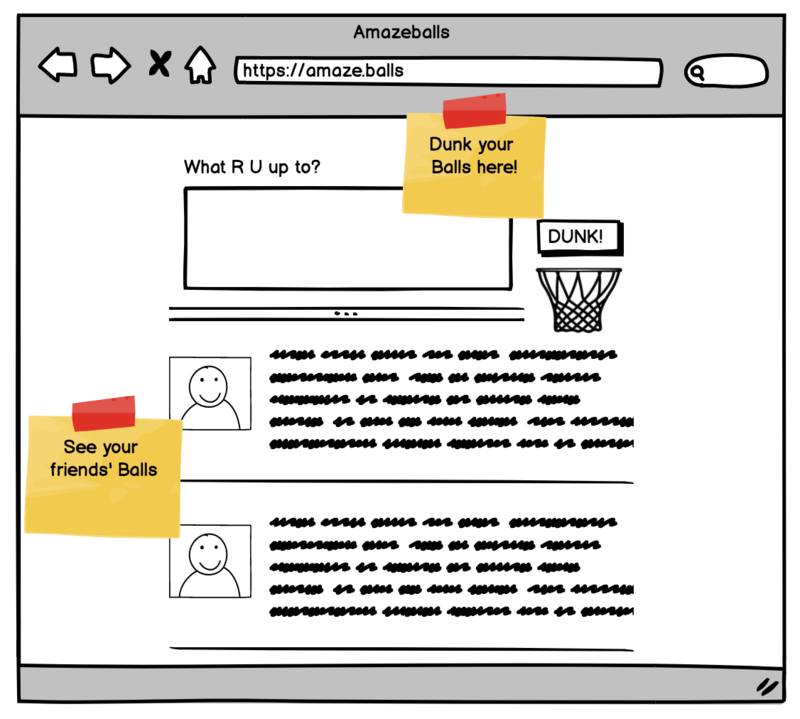 At the top is a form for posting Balls, below that are your friends’ Balls. Firestore can directly be accessed using normal HTTP methods which makes it a full backend-as-a-service solution in which you don’t have to manage any of your own servers but still store data online. Sounds powerful and daunting, but no sweat, I’ll guide you through the steps of creating and hosting this new web app. Notice how big the scrollbar is on this page; there’s not a huge amount of steps to it. Also, if you want to know where to put each of the code snippets in a code repository, you can see a fully running version of Amazeballs on github. Vue.js has a command-line interface (CLI) for scaffolding projects. We’ll use that to get the bare-bones set-up quickly. First, install the CLI, then use it to create a new project based on the “webpack-simple” template. If you follow the steps on the screen (npm install and npm run dev) a browser will open with a big Vue.js logo. Next up, we need to create a Firebase project. Head on over to https://console.firebase.google.com/ and create a project. A project starts out in the free Spark plan, which gives you a limited database (1 GB data, 50K reads per day) and 1 GB of hosting. This is more than enough for our MVP, and easily upgradable when the app gains traction. Click on the ‘Add Firebase to your web app’ to display the config that you need. 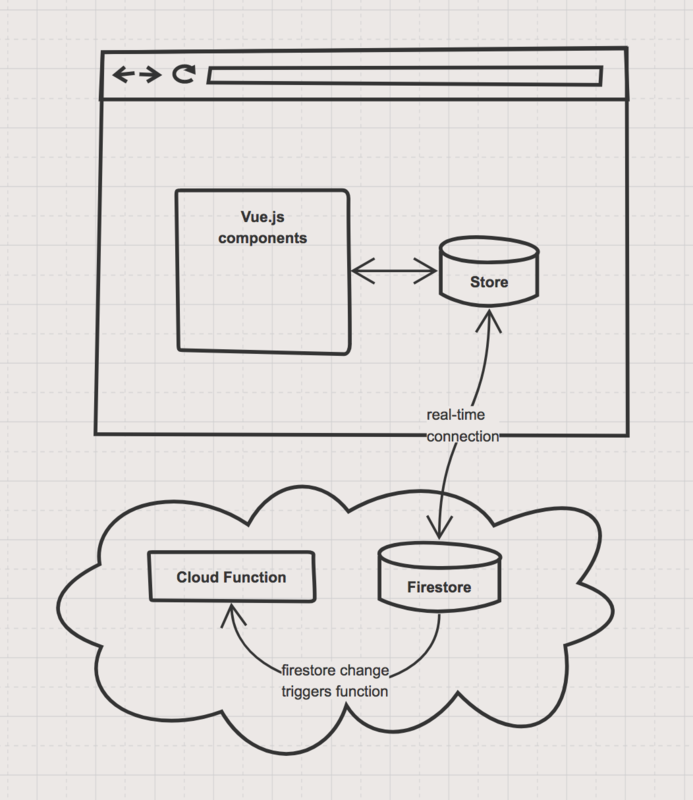 We’ll use this config in our application, but in a nice Vue.js manner using shared state. First npm install firebase, then create a file called src/store.js. This is the spot that we’re going to put the shared state in so that each Vue.js component can access it independently of the component tree. Below is the content of the file. The state only contains some placeholders for now. // The shared state object that any vue component can get access to. // Has some placeholders that we’ll use further on! Notice how the two are completely decoupled. When you insert into a collection, the onSnapshot is triggered because you’ve inserted an item. This makes state management a lot easier. Now you have a shared state object that any Vue.js component can easily get access to. Let’s put it to good use. First, let’s find out who the current user is. Firebase has authentication APIs that help you with the grunt of the work of getting to know your user. Enable the appropriate ones on the Firebase Console in Authentication → Sign In Method. For now, I’m going to use Google Login — with a very non-fancy button. Due to these three lines, every time the currently-logged-in user changes (logs in or out), store.currentUser also changes. Let’s post some Balls! You’ll get a file named firestore.rules where you can add authorization for your app. We want every user to be able to insert their own balls, but not to insert or edit someone else’s. The below example do nicely. It allows everyone to read all documents in the database, but you can only insert if you’re logged in, and the inserted resource has a field “author” that is the same as the currently logged in user. It looks like just a few lines of code, but it’s very powerful and can get complex very quickly. Firebase is working on better tooling around this part, but for now, it’s trial-and-error until it behaves the way you want. If you run firebase deploy, the Firestore rules will be deployed and securing your production data in seconds. 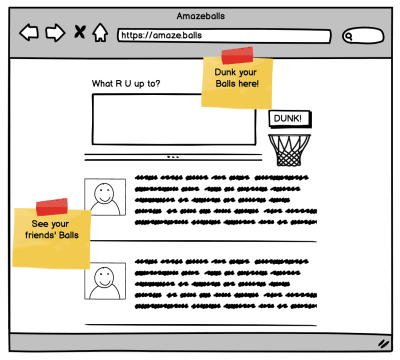 On your homepage, you want to see a timeline with your friends’ Balls. Depending on how you want to determine which Balls a user sees, performing this query directly on the database could be a performance bottleneck. 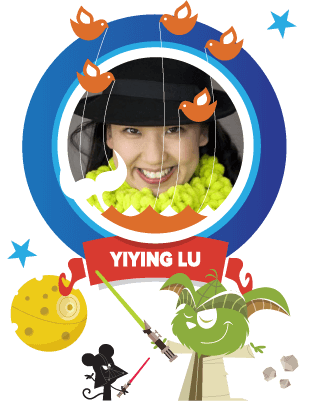 An alternative is to create a Firebase Cloud Function that activates on every posted Ball and appends it to the walls of all the author’s friends. This way it’s asynchronous, non-blocking and eventually consistent. Or in other words, it’ll get there. To keep the examples simple, I’ll do a small demo of listening to created Balls and modifying their message. Not because this is particularly useful, but to show you how easy it is to get cloud functions up-and-running. Oh, wait, I forgot to tell you where to write this code. This creates the functions directory with an index.js. That’s the file you can write your own Cloud Functions in. Or copy-paste mine if you’re very impressed by it. Firebase has its Hosting option available for this, and you can use it via the Firebase CLI. Choose distas a public directory, and then ‘Yes’ to rewrite all URLs to index.html. This last option allows you to use vue-router to manage pretty URLs within your app. "deploy": "npm run build && mkdir dist/dist && mv dist/*. * dist/dist/ && cp index.html dist/ && firebase deploy"
Now just run npm deploy, and the Firebase CLI will show you the URL of your hosted code! This setup is perfect for an MVP. By the third time you’ve done this, you’ll have a working web app in minutes — backed by a scalable database that is hosted for free. You can immediately start building features. Also, there’s a lot of space to grow. If Cloud Functions aren’t powerful enough, you can fall back to a traditional API running on docker in Google Cloud for instance. Also, you can upgrade your Vue.js architecture with vue-router and vuex, and use the power of webpack that’s included in the vue-cli template. It’s not all rainbows and unicorns, though. The most notorious caveat is the fact that your clients are immediately talking to your database. There’s no middleware layer that you can use to transform the raw data into a format that’s easier for the client. So, you have to store it in a client-friendly way. Whenever your clients request change, you’re going to find it pretty difficult to run data migrations on Firebase. For that, you’ll need to write a custom Firestore client that reads every record, transforms it, and writes it back. Take time to decide on your data model. If you need to change your data model later on, data migration is your only option. So what are examples of projects using these tools? Amongst the big names that use Vue.js are Laravel, GitLab and (for the Dutch) nu.nl. Firestore is still in beta, so not a lot of active users there yet, but the Firebase suite is already being used by National Public Radio, Shazam, and others. I’ve seen colleagues implement Firebase for the Unity-based game Road Warriors that was downloaded over a million times in the first five days. It can take quite some load, and it’s very versatile with clients for web, native mobile, Unity, and so on.